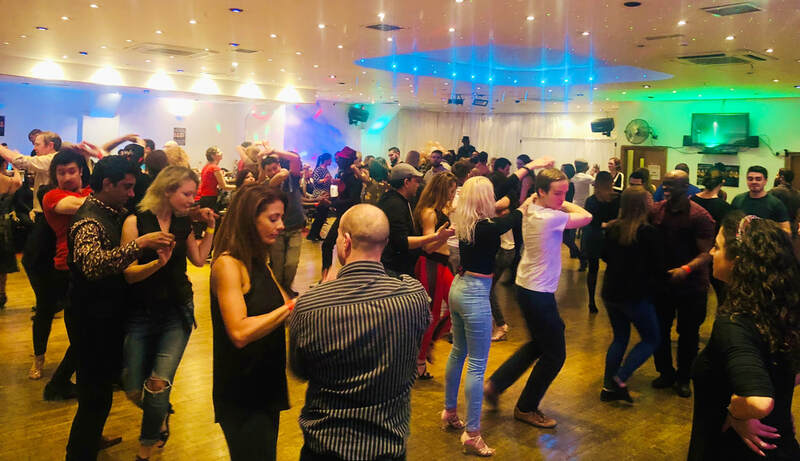 Dsantos Dance UK is a dance school based in London, UK, hosting regular weekly Salsa, Kizomba, Bachata classes and fantastic parties. We welcome you to join in the fun as we celebrate great African and Latin music and culture in the way we know best....dance, dance and more dance! Whether you're looking for fun dance lessons, an eclectic mix of people to meet and socialize with, or just want to try something new, theres always good times to be had. From Salsa, Bachata, Cha Cha and Merengue to Kizomba, Semba, Kuduro and Afrohouse, we love it all and are excited to share it with you. We understand the passion, joy and exhilaration borne from dance and are committed to sharing it with you, our community. We are driven by the wider goals of promoting community health, development and cultural awareness above and beyond the joys of dancing. ​Group classes - Workshops - Private tuition - Performances/entertainment - Wedding functions & dance training - Parties, Dj'ing, MC'ing - Corporate events - Schools - Special needs dance sessions. Please visit our testimonial page to read what some of our customers have had to say. This fun and sociable lesson format strikes a great balance, providing the environment to learn dance along with the enjoyment and excitement of meeting new people and making new friends. Our weekly Salsa and Kizomba classes are examples of this type of class. Click on the link below to find out more about these classes. This lesson style provides the necessary time and space to really focus on key aspects of dance technique, skill or understanding that an individual may be struggling with or really want to master. Being a one on one lesson (or potentially a small group) this format provides the most concentrated learning environment, allowing the instructor to gain the greatest level of understanding of the students wants and needs, really pushing your dance ability to the next level! Workshops are group lessons that focus on a particular aspect of a dance style, exploring things in more depth. These types of classes allow us to cover details and breakdown technique which we otherwise would only be able to discuss briefly in a regular group lesson. Types of workshops include Body movement and isolation, Ladies styling, Spinning technique and Afro-Cuban rhythm. Bootcamps are more intensive sessions where back to back classes and workshops are taught in a day or over a weekend to boost the level of a group of dancers or community. Richard Voogt is the founder of Dsantos Dance UK, an African & Latin dance academy and entertainments company based in London, UK and has performed and taught at some of the biggest dance festivals around the world. Originally from Cape Town, South Africa, Richard was immediately captivated by the welcoming and eclectic nature of the dance community on his first outing. Having begun his training in the Latin dance genres including Salsa, Bachata and Merengue almost 11 years ago, Richard was naturally connected to the African dance styles of Kizomba, Semba and Kuduro/Afrohouse when he was introduced to them by his dance mentor, world famous dancer and choreographer Manuel Dos Santos, over 7 years ago. Over the last 7 years, Richard has taught and hosted events to engage the community through dance in a variety of capacities including at international dance conventions, university diversity programs, to secondary schools, special needs groups as well as in the corporate world and as part of regular weekly dance classes. Richard has taught at international dance conventions such as the Baltimore Salsa congress USA, 'On the Wave' Latvia Festival, Azembora Perm Kizomba festival and Antalya Mediterranean Latin dance festival. Richard has also performed at numerous festivals such as the LA Salsa Fest, New York Salsa Congress, Aventura Dance Cruise, Criola Beach Festival, Madrid Sensual Dance Symposium and Mzanzi Cape Town Salsa Festival, to name a few. Manon Batrel, from Brest France, started dancing as a child in various forms including Ballet and African dance. At the age of 15 years old Manon started to learn Kizomba and later Bachata and Salsa. Manon started teaching over 3 years ago, specifically focussing on the ladies role in partner dancing, their technique and styling. In 2017 Manon moved to London where she joined Dsantos Dance UK as Richard Voogt’s dance partner, and as an instructor. Richard & Manon now teach and perform together in the Dsantos Dance UK weekly classes and at dance festivals all over the world.